This photo shows the steel truss bridge in the late stages of construction when the roadway/deck was being surfaced. The Kummer Bridge was built from June 1932 to October 1933 to provide a more direct route between Black Diamond and Enumclaw. Can you imagine a bridge of this height (155 feet above the Green River); width (28 feet); and span (688 feet) being built in a mere 17 months today? Originally called the Kummer Cut-off Bridge, it is now officially known as the Dan Evans/Green River Bridge, but often called the SR-169 or High Bridge. Its namesake, Kummer, was a nearby coal and clay mining community. 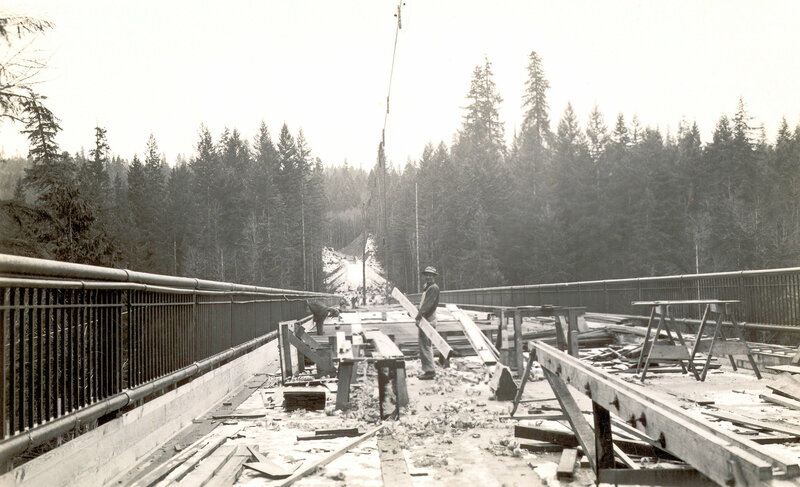 This photo was taken by Thomas Blum, a licensed surveyor, who also served as bridge inspector for King County from 1924 – 1934. During the early 1930s, Blum traveled throughout the county inspecting and photographing bridges. He had an artist’s eye for composition and detail and photographed hundreds of county bridges. This photo, looking south to the Enumclaw side of the bridge, shows the wooden forms being set for a concrete pour. The thin line, which appears in the top center, is not a photo defect but a highline used to move materials in the days before cranes became common. This photo comes courtesy of the King County Department of Transportation road files #474.11.12. My dad Bill Petchnick was Born in Kummer in 1910 as well as his sister Mary in 1911. Their sister Sylvia was born on the farm in Enumclaw 5 years later. Daddy told us about the bridge being built, very interesting.